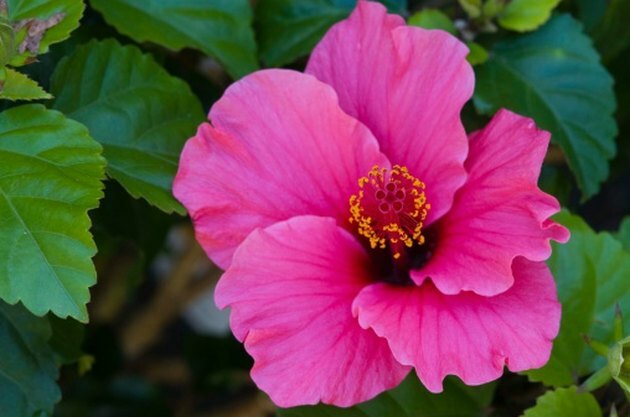 The rose of sharon (Hibiscus syriacus), also known as the shrub althea, is best known for its large, highly ornamental flowers, which come in a range of colors. It's hardy in cooler climates than the tropical hibiscus, growing as far north as USDA hardiness zone 5. The rose of sharon grows either as a small tree or a full shrub, reaching up to 12 feet tall and 10 feet wide. The colorful blooms attract bees and sometimes hummingbirds. The rose of sharon is a kind of hibiscus. Brilliant pink is one of the most popular colors for the rose of sharon. For rosy blossoms, select from cultivars such as the 'Ardens', which has double blossoms with pinkish-purple petals. Some of the most commonly found varieties are released by the United States National Arboretum (USNA), as part of their extensive breeding efforts, and feature advantages such as a lower rate of seedlings forming around the plants from dropped flowers. USNA-produced varieties include the "Minerva," with pink-lavender flowers with intense red centers, and the highly ruffled "Aphrodite," with petals that change from dark pink at their outer edges to deep red in the center. The USNA varieties typically reach heights of around 10 feet tall. For pure pink color, select from the double-blooming 'Leopoldii Plenus' or 'Paeoniflorus' or the single-blooming "Lucy" or "Rubus." White is another popular color for rose of sharon flowers. USNA varieties include the "Diana," with pure white flowers, and the heavily ruffled "Helene," which has white flowers with red centers. The "Helene" may have anywhere from three to 20 petals. 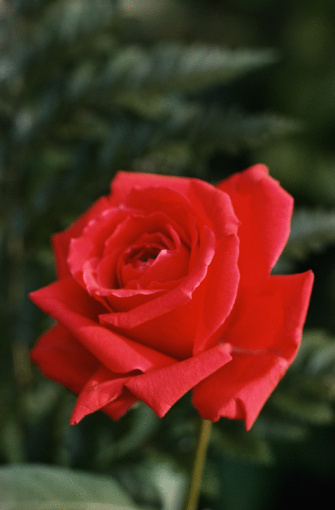 The "Red Heart" also produces flowers that are white on the outside and red in the center. The "Jeanne d'Arc" has double blooms, with two layers of pure white petals. The "Lady Stanley" has semi-double flowers, fuller than single blooms, that have white petals with red streaks. For a pure white bloom, opt for the "Totus Albus" or the "Admiral Dewey." The "Bluebird" offers a most unusual delight: a sky blue flower with a touch of deep red concentrated at its center. The "Boule de Feu" (or "Ball of Fire") has double blooms with purple-red petals. The "Coelestis" flowers are single-blooming, violet-blue at the edges and a red-purple color at the center. For a more lavender shade, you can opt for "Coerulis," a semi-double. The "Souvenir de Charles Breton" also bears semi-double flowers with a lighter shade of purple and the "Coerulis Plenus" steps things up with double-blooming lavender flowers. The "Woodbridge" has single, red-purple flowers that gradually go from dark purple, at the throat, to lighter shades at their edges.